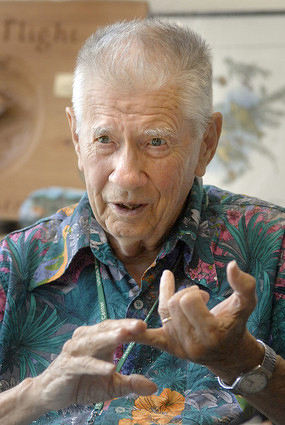 Chandler S. Robbins, 94, is a living legend, one of the most important figures in the history of bird identification, bird conservation, and birder education. In the print version of the September 2012 Birding, we proudly present an extended interview with Robbins, along with tributes by a dozen conservationists and educators whose careers have been significantly influenced by him. Right: Chandler S. Robbins discourses on some matter or matters related to bird biology. In a moment, he will erupt into his legendary smile. Note also his eternal and legendary hairdo. Do you have a Chan story? Please share it in the comments field, below.